According to relatively reliable sources, a Glenlivet. The sweetness of Josefine shows right in the nose. Haribo Tropical Fruits, caramel, overripe fruits. Behind it vanilla and a pleasant freshness. In the mouth you can feel the oak cargo, bitterness joins to the pronounced sweetness. Pepper tickles tongue and cheeks and warms. In the finish, the oak remains long, very long persist, some cocoa, some cinnamon. Nice! Conclusion: Great Malt, for those who like very sweet malts. The age shows in the taste nevertheless by quite bitter oak notes. 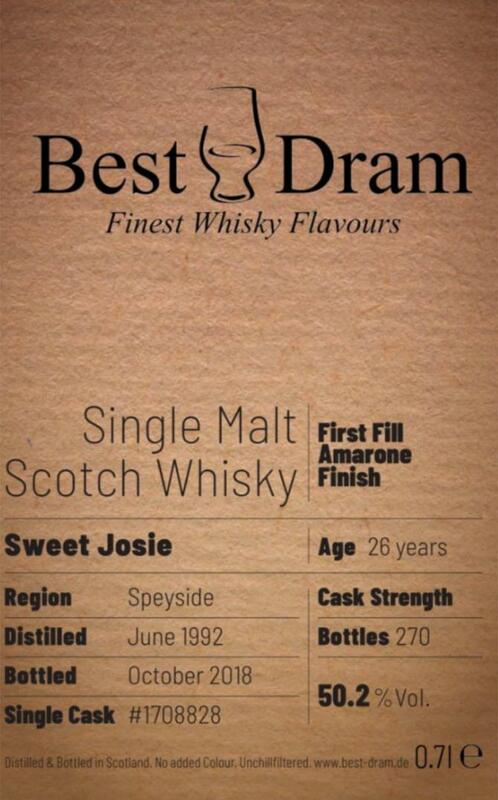 Sure, it could be more complex, but hey, 120 Euros for a 26 year old malt are really ok. In addition, he is really delicious. warm fruit compote, red berry, vanilla, caramelized sugar, balanced. sticky sweetness, fruit salad with maple syrup, vanilla, peppery and unquestionably neat aroma from the bourbon barrel. vanilla, oak, a hint of red fruits, long. Nose: You can smell the sweet wine, fruits. But rather closed. Some cooked mash. Mouth: Incredible sweetness. If this is what you like in whiskies, then you are in paradise here. Mixture of dark und bright sugared fruits, almost like gummybears. I loved it! Doesn't taste this old. Finish: Astoninglishly long, now the age statement with 26 y. comes into the fight. Portion of balanced wood and oak appears and the finish stays quite long! 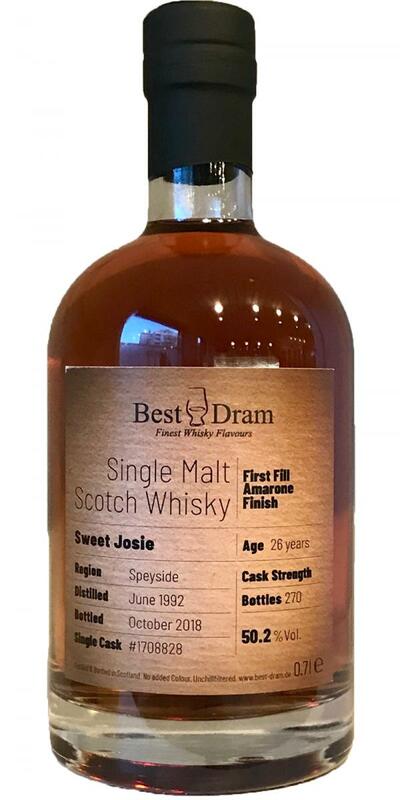 Great whisky, if you are into big time sweetness. Balanced and tasty. Character of a mature Glenlivet. Old bourbon barrel, spicy, sweet vanilla, mineral barrel notes, subtle light to red fruit. Long, excellent vanilla notes with a harmonious oak bitterness and nice sweetness.